As a realtor, leads are your bread-and-butter. Whether you’re pumping time into inbound marketing, outbound marketing, social media strategies, or influencers, you’re end goal is shoving prospects through your funnel. But, getting leads has always involved a certain level of friction between you and your customer. When they viewed that killer content that you created, and you drove them to your perfectly designed landing page, there was that moment of hesitation when it came time to input their personal details. That small road-bump was a big issue. You spent the time and money to drive that prospect all the way to your landing page. They liked your content, they fit snugly into your buyer’s persona, and they seemed like a clean sell, but when it came to inputting all of those fields of personal information, they backed out. Luckily, Facebook lead ads set out to remove this friction. Now, prospects can transition into leads without ever leaving Facebook. Since Facebook will automatically generate their lead information from personal details on their Facebook profile, prospects no longer have “fill-out” friction. 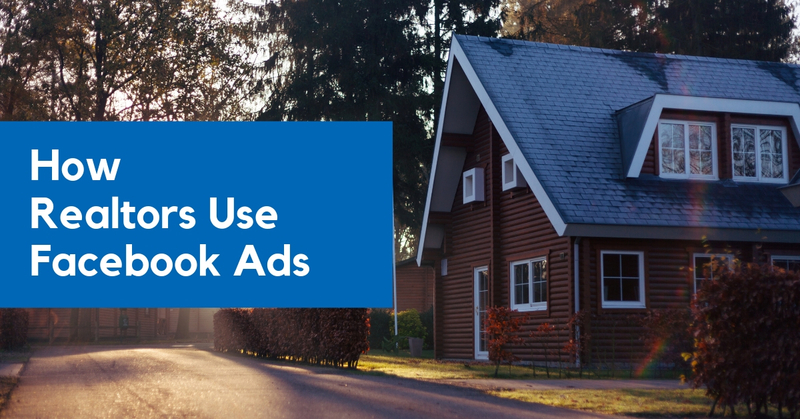 Today, we’re going to look at 5 exciting ways that realtors are using Facebook lead ads in brilliant ways to fill their funnel full of quality hyperlocal leads. One of the biggest hurdles for realtors has always been targeting a hyperlocal market. While big brands push money into comprehensive inbound marketing strategies and expensive influencers, realtors are left to navigate the world of advertising in a local market. HubSpot, Moz, and Niel Patel are all great for businesses that aren’t location-based, but realtors have to find a way to get scrappy with their ads to win a local prospect. Facebook lead ads are a natural place to get creative in a hyperlocal market — since you can geotarget prospects. We’re seeing some great Facebook lead ads that take advantage of local value as a lead magnet. 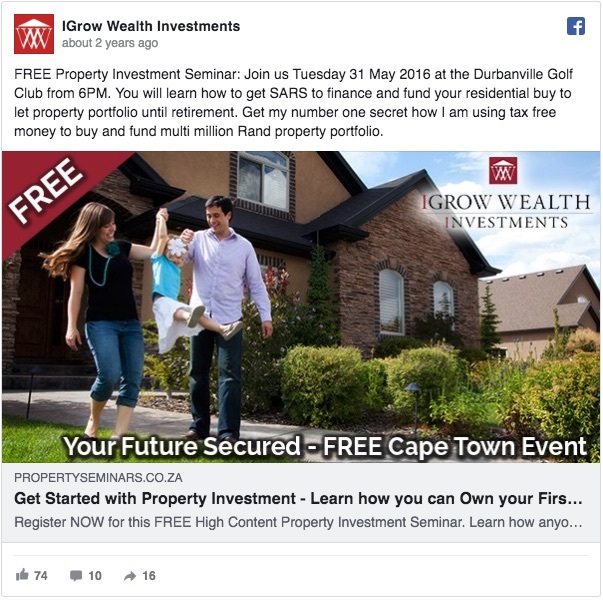 IGrow used Facebook lead ads to target customers who lived in the Durbanville area and fit within their ideal income level. 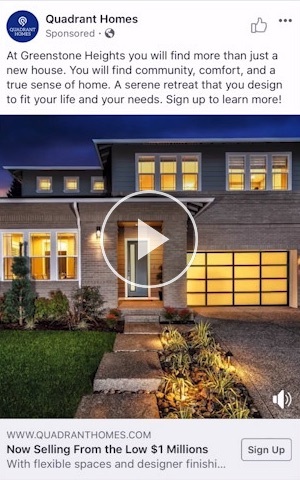 Instead of just showing another home, IGrow used Facebook lead ads to get prospects to sign up for a free seminar that they were holding in the area. This is a double whammy. They are grabbing prospects and generating leads online and directing these leads to their front door for real-life nurturing. Free seminars are just one example of a great local value lead magnet. You can also offer free home evaluations like Keller Williams or point customers to cheap food or great entertainment in the area. You’ve probably read the word “hyperlocal” about 15 times by now, and we’re sure that you’re used to hearing it in other marketing spaces online, but, sometimes it’s important to diversify your portfolio. Sure, you want to target people in your local area, that’s your audience. But, what about customers that are looking to move to your local area? If you get too hyperlocal, you’re going to miss delivering critical ads to future residents. With Facebook, you can target customers who live in areas around your local area that have been searching for homes in your area. This is the perfect time to deliver ads that will impact their decision. 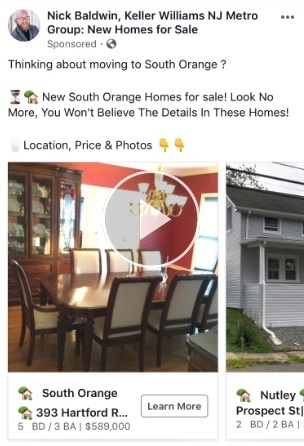 When Ylopo created Facebook ads for their client — a New Jersey realtor — they decided to throw their net a bit wider. Ads with the words “Are you thinking about moving to New Jersey?” were followed by pictures of homes that fit into their Facebook target audience’s income level. Those are some impressive metrics! We see “check out this home!” posts a ton of Facebook. It’s not that they don’t work — they do. But, when there are massive amounts of similar ads on any platform, people start to get numb to them. Sure, that picture of a house is great and all, but how about showing some high-quality images of each room? As a realtor, can you leverage high-quality photos in a way that pushes users to engage with your ads? We know! 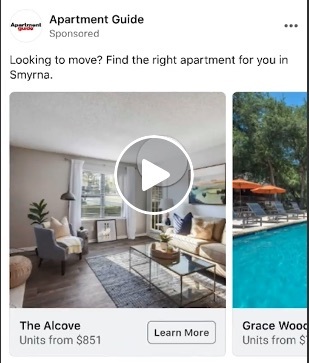 Apartment Guide is hardly a small local realtor, but the way that they’ve been able to transform the standard real estate Facebook ads is nothing short of amazing. Not only were they able to get some killer metrics out of their latest campaign (2x property inquiry conversion, etc.) they were able to do it with little-to-no words. Instead, Apartment Guide posted some high-quality photos of the insides of apartments on a carousel, led users to a “see more” page that acted as a lead creator, and used the lead information to continue to push users down their funnel. By using some of Facebook’s more creative ad types and then leading them to a Facebook Lead Ad, Apartment Guide was able to leverage profoundly creative content. This is an excellent example of a more nurturing marketing strategy. Instead of starting off strong, Apartment Guide started of gentle and slowly shaped prospects into customers. While Ylopo worked some magic outside of their local area, pushing Facebook lead ads to hyperlocal prospects works wonders. Most realtors have a testimonial section on their website right? Why not use those testimonials to draw clients in on Facebook? This works exceptionally well if you work in a community that’s congruent and connected. Put up an advertisement that shows the faces of some of your testimonials (with consent) and leverages their reviews. If you work in a small area, a ton of your Facebook targets are probably going to know (or know of) the person giving you a testimonial. What’s better than seeing an ad on your Facebook news feed with someone that you know who loved a realtors service? Talk about instant trust. There are other social proofs you can use as well (such as how many people have used your service,) but testimonials seem to work wonders for realtors. Quadrant homes nailed using social proofs as a lead generation tool on Facebook. Their entire ad campaign focused around the central idea of community. They used community-driven buzzwords (community, local, connection, etc.) and testimonials to drive leads. Positioning yourself as a community member isn’t only a lead machine, it also helps build immediate trust and brand recognition. Facebook lead ads can be a great way to generate quality leads while reducing “fill-out” friction. For realtors, Facebook lead ads are a great place to get creative and scrappy. Create some unique ads that utilize community, lead magnets, hyperlocal and nonlocal prospects, and social proofs for some killer results.